Home » The Law & You » Can We Sue the Doctor for Our Daughter’s Birth Injury? Can We Sue the Doctor for Our Daughter’s Birth Injury? A viewer states her 5-year-old daughter’s cerebral palsy was caused by birth trauma. Can the parents still sue the doctor who delivered her? Medical malpractice lawyers Greg Fellerman and Ed Ciarimboli explain what can be done next. Dave Kuharchik: Time again for “The Law & You,” featuring the area’s premier attorneys. You know the guys, attorneys Greg Fellerman and Ed Ciarimboli. Good to see you guys. Ed Ciarimboli: Dave, did you have a good vacation? Dave: I absolutely did. Good time in the sun. Dave: I’m refreshed, I’m bright, I’m tan. And we’re ready to talk law tonight. Here’s the question tonight and this is Mary from Clarks Summit. Mary says, “My daughter is five years old and suffers from cerebral palsy. Her new doctor said that it may have been caused by birth trauma. Is it too late for us to sue the doctor?” So they’re saying the daughter’s five. Ed: Mary, it is not too late. And these are the type of cases we encounter frequently, we’ve handled in the past at our firm. One of the things you need to do immediately is get all your medical records. Both your records and your daughter’s records, pre-pregnancy up until the age of five. Because we’re going to need to look at all of those. It’s not too late to sue, your daughter has from the time she’s 18 plus. But you’re going to want to get moving on this very quickly. Greg Fellerman: This is a great piece of legislation, the Minors Tolling Statute, that allows minors to recover after 18 years plus two years, which, again, when they reach the adult age, you can make that decision. It’s a great law, allows people in this exact situation to seek recovery if there was, in fact, damage to the baby at that time when they were birth. So that’s some smart legislation for some people. Really well done. Dave: And if you need legal direction when it comes to birth trauma, you can contact these guys. Their number, their website, they’re easy to get a hold of. 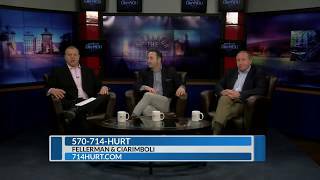 And of course, results matter with attorneys Greg Fellerman and Ed Ciarimboli. Guys, thanks so much. Greg and Ed: Thanks, Dave.